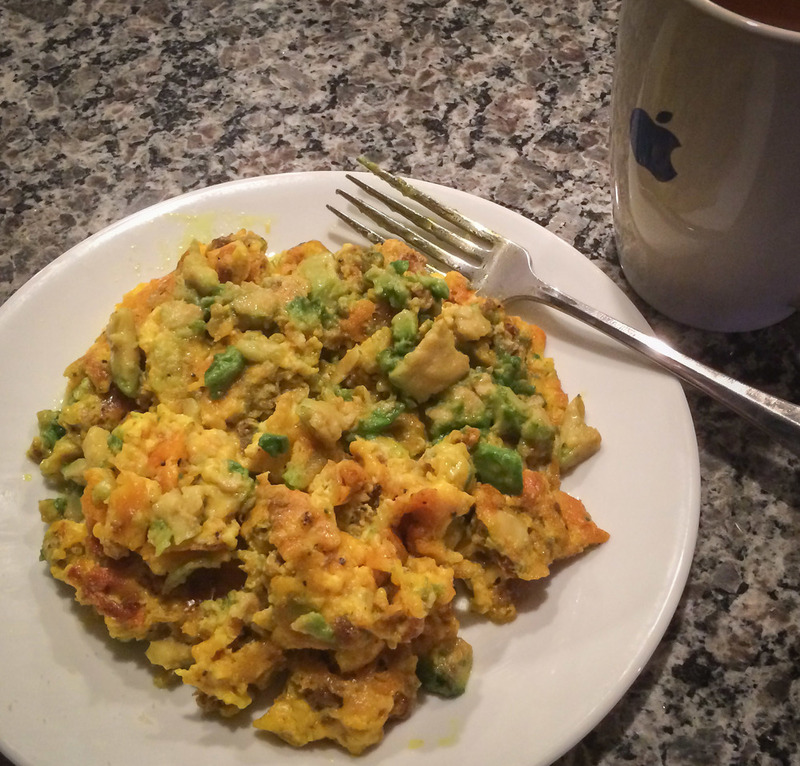 A good place to start this blog on my eating choices is to start with breakfast. First, I don't believe that breakfast is the most important meal of the day or that it is important to break the fast you've had over night in order to have energy for the day. (In fact, in a later post I'll talk about how I like to skip breakfast, and even lunch to keep the fast going.) For me though, breakfast is a meal that I enjoy and there's something reassuring about starting the day with something familiar. I also think it's probably one of my healthiest meals and, it tastes good. My typical breakfast consists of 3 eggs (from pastured chickens from a farm that I trust) cooked in virgin coconut oil, with sausage mixed in. Before it's done cooking, I add half an avocado, and a tablespoon or so of Kerry Gold butter. I cook the sausage with some Turmeric and add a little sea salt and ground black pepper to the whole thing. As far as macronutrients are concerned, this is a pretty darn good meal. High in fat, a moderate amount of protein, and almost no carbohydrates. I think having high fat and very low carbohydrates in the morning is valuable since my body has shifted into fat burning mode after fasting all night and this keeps the process going. Carbohydrates would shut that process down. I cook in coconut oil for the beneficial addition of fat and add the butter for the same reason, along with the fact that it makes it taste great. For my typical breakfast, that I have while at home, the quality rating scores high as well. The reasons for this is that I use eggs from pastured chickens that spend time in the sun, exploring the ground and eating what they find (various plants, bugs, and whatever else) and don't just eat a bunch of grains. They're eating more of the diet they evolved to eat. This has a great effect on the quality of the nutrients in the eggs. Using butter from grass fed cows has similar benefits. In addition, butter from grass fed cows has a high content of something call conjugated linoleic acid or CLA. CLA is a fatty acid that has the benefit of triggering enhanced fat loss. Grass fed butter is about 2/3 saturated fats and 1/3 monounsaturated fats, and the polyunsaturated fats have an ideal 1:1 ratio of omega 3 and omega 6, non-grass-fed butter has a less ideal, higher level of omega 6. Avocados have lots of great things going for them nutritionally. In terms of fat quality they're high in monounsaturated fats. Overall they're high in fat and fiber and have almost no starch or sugar. The coconut oil has a high saturated fat content, but more importantly, much of the saturated fat is of a special type called medium chain triglycerides (MCT) that have a special quality of being able to be used in your body only to form ketones. You'll hear more about ketones in many other posts on this site. The one questionable ingredient in my typical breakfast from a quality standpoint is the sausage. I just use Bob Evans original pork sausage. This is fine, particularly from a macro-nutrient standpoint, but I'm not sure about the source of their pork. It could be from factory-farmed pigs being fed an unnatural diet. I like to get sausage from a nearby farm that I get most of my meat from but the seasoning on their sausage isn't something that my wife likes so well so I use the Bob Evans. As I said though, it's not about being perfect and I think this has a minimal effect on the overall nutrition of this meal. From the standpoint of micronutrients, my breakfast is also very good. Numerous beneficial vitamins and minerals from the pastured eggs, grass fed butter, avocados, and coconut oil. I also like to cook them with unrefined sea salt which adds good minerals and no additives that can act as "anti-nutrients." I also season the sausage while it cooks, before I add the eggs, with Turmeric. A key component of turmeric is curcumin which is a great natural antioxident and potentially has numerous health benefits.